Choose from 7 American Hardwoods including Cherry, Maple, Birch, Hickory, Oak, Alder or Quartersawn Oak. Choose between 36 Hardwood doors including mitered, raised panel, flat panel applied molding and inset. Select from an attractive palette of stains, paints, glazing or distressing options. Our protective topcoat offers a high-performance smooth, durable finish. 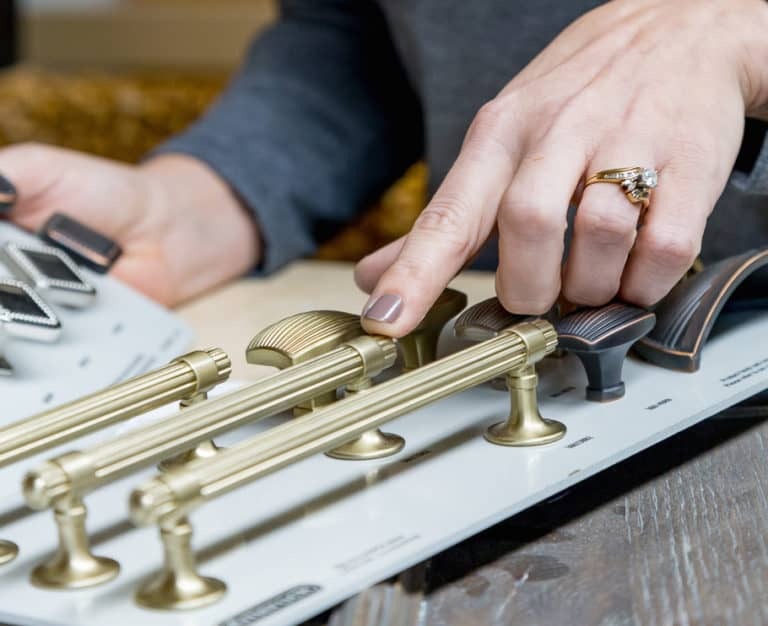 Select the latest decorative knobs, handles & pulls in a variety of finishes, as well as operational features including Blumotion Soft Closing under-mount full extension slides and soft-closed concealed hinges so you avoid slamming doors and pinched fingers. Make your rooms more functional and life less complicated with space-saving devices like cutlery trays, pullout waste/recycle bins, mixer lifts, tip-out trays, spice racks, wine racks, pullout bases with shelves, lazy susans and more. For looks of distinction, add architectural elements and decorative woodcarvings including corbels, pilasters, range hoods and island legs. 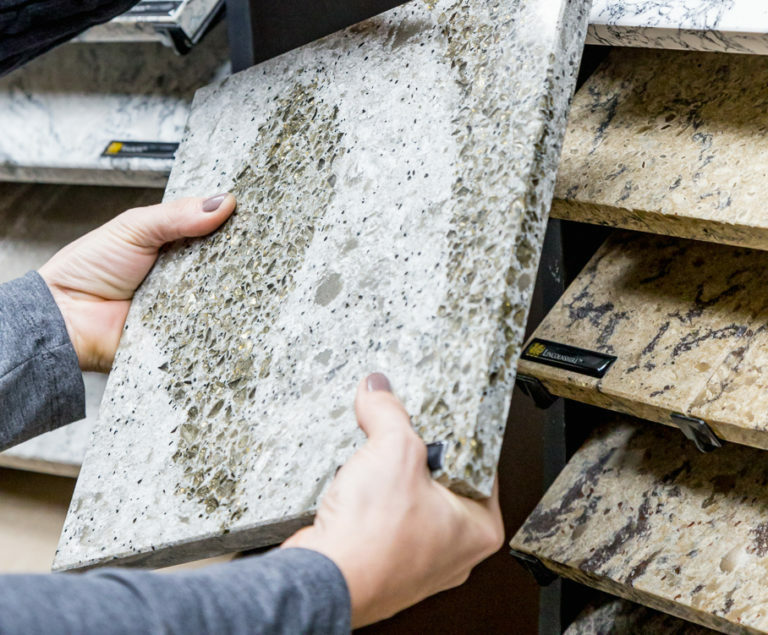 Choose from the best brands in granite, quartz, solid surface, cultured marble, soapstone, laminate, butcher block. If you would like to view the latest countertops and decorative hardware, visit our showroom in Mosinee. We would love to show you our fine cabinetry too for your kitchen and bathroom projects. Call to schedule an appointment at 715-693-2670. MEETING – Bring in blueprints or a sketch with some dimensions including room width & height, window & door openings and plumbing locations. If you’d rather have a home visit, we’ll stop for a flat fee that gets credited back to you upon placing an order. INITIAL ESTIMATE – In a matter of days, you’ll have an estimate outlining the information we’ve gathered including tear–down, delivery and installation. You approve the project and we get working on the design. APPROVE DESIGN – We’ll present computer drawings and review your entire project from start to finish. With your signature and a down payment, we’ll start building your custom cabinets. PRODUCTION – Your drawings go to the shop floor where our experienced craftsmen hand select boards, carefully sand, machine and assemble your order. Our finishers carefully stain, paint or glaze units and seal with an ultra-high performance coating system. You’re welcome to stop in and see your cabinets anytime during this process. INSTALLATION – Before delivering your cabinets, we can arrange for teardown and removal of existing cabinets if needed. Then, we’ll precision fit every element. When finished, we perform a final inspection and clean up. WARRANTY – We stand behind our work. If something ever fails on our part, we’re here to help as long as you own your home. Think of it like having your own personal chef. You get everything you want without the hassle. That’s how we create your custom cabinets. They’re handcrafted to fit your unique space and your personal tastes. Never skimping on quality, we use all-plywood construction, hardwood dovetail drawers, soft-close hinges and glides, hand applied stains, to name a few, and stand by our work. What makes Swita Cabinetry stand out? In a world where it seems like there’s less responsiveness and follow-through, we’re here for our customers from start to finish. We’re on-time, accurate and ready to answer your questions. What kind of finish do you use? Our finish is one of the most important features as it protects your cabinets and keeps them beautiful long into the future. All of our stains and glazes are hand-applied to enhance wood’s natural beauty and then sealed with durable, scratch resistant topcoats. Our catalyzed conversion varnish protects your woodwork from damaging chemicals and moisture, while creating a soft luster with a silky smooth feel. How long will it take to get my cabinets after placing an order? Normally, our lead-time is about 4-8 weeks. If you’d like to know our current status, please email pete@switacabinetry.com. Yes, we have a showroom with cabinet displays, countertops, hardware, door styles and accessories. You’re welcome to check out samples and match them in your own setting. Call us to schedule a visit at 715-693-2670. We’re located at 144805 W. Hwy 153 in Mosinee. Can someone come to my house? Yes, if you’d like a home visit, we’ll stop for a flat fee that gets credited back to you upon placing an order, and during that meeting we can take measurements and offer ideas. Where can I get Swita Cabinetry? Swita Cabinetry is exclusively offered at our shop in Mosinee, WI. You get to buy direct and work one-on-one with the people making your products. Swita Cabinetry offers a limited lifetime warranty on our cabinets. We want happy customers for life so we stand by what we sell. How do I care for my custom cabinetry? We recommend the use of mild soap and water or mild cleaners to wipe down your cabinets. Avoid abrasive cleaners and scouring pads. Also, you can make a few minor adjustments to the cabinets if needed by adjusting your Blum Hinges and removing Soft-Close drawers.